GL702ZC - Wattman doesn't exist in drivers? The GL702ZC laptop has a desktop grade RX 580 inside with 4GB VRAM and a desktop Ryzen 1700. I was wondering, why isn't Wattman showing up in any of the Adrenaline drivers under Global settings and does AMD plan to do something about this? I have supplied a picture of what my Adrenaline drivers look like (I'm running the latest ones). This laptop seems to be a real success, but we need Wattman to undervolt the GPU on the VRAM as well as a core. Latest MSI Afterburner can only be used to undervolt the core clocks (I was able to get a stable -93mV across all workloads, and even -100mV works sometimes), however, MSI Afterburner does not offer VRAM undervolting (which I think is needed, because running 2000 MhZ at 1V seems a bit high... we might be able to get away with a lower voltage on the memory and further decrease temperatures and power draw (not to mention allowing us to reduce voltages on other P states as well). Maximum temperatures with -93mV are in the area of 73 - 75 degrees Celsius - which is of course a lot better than 85-88 degrees C without undervolting... and of course, it helps keep the laptop fans in check too. Also, having Wattman in drivers for this GPU would remove the need from constantly fiddling with MSI Afterburner, as Wattman is also a program specifically designed to work with AMD hardware (giving us better control over it). I imagine because Wattman can be used to Overclock GPUs which is pretty much prohibited by Laptop manufacturers. Laptops are not engineered to be Overclocked in any way, otherwise it could end up damaging the Laptop. Wattman is meant to be used on a Desktop that has no restrictions while Laptop do have restrictions. Need to remember, your RX-580 is a Laptop GPU not a Desktop GPU. It was made to run in a laptop under the laptop's specs. the GPU would still benefit from undervolting. Except that Wattman is not only used for overclocking. the voltages to all of their GPU's from factory to improve yields. Take my Ryzen 1700 CPU in the laptop for example. damaging anyhing... but it depends on the individual system. juice and that would only bring minimal improvements even if it were done. undervolt and see if I can drop power consumption further. I understand what you are saying. 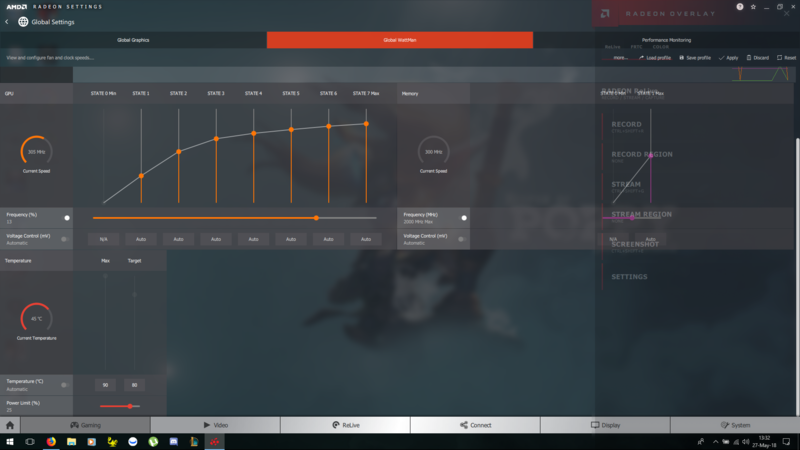 But if other users with Laptops see that Wattman is available, they may try to OVERCLOCK or change some other parameters on the GPUs causing unknown consequences with the laptop. In my opinion, I believe this is the reason why AMD doesn't make Wattman available for Laptops. One of the Moderators here in AMD Forum could probably give the actual reason why Wattman is not included in Mobile Driver sets. laptops or on desktops. Plain and simple. and cooling... majority of the time, they usually settle on an undervolt. overclocked incorrectly - which has been done before. laptops when it comes to such modifications. Laptop users who do such modifications tend to be a lot more careful. drivers written for desktop (not laptop). not showing up in drivers. Because the device ID of the GPU probably indicates that it's a laptop device ? Unfortunately, there is nothing more than can be done. Due to thermal issues, most laptops are not designed to support overclocking. Enabling Wattman on a laptop would enable BOTH under and overclocking, so it's disabled. Except that many laptops have a tendency to experience thermal throttling and hardware failures more often than not because OEM's don't design adequate cooling in the first place for STOCK clocks. Wattman is needed in laptops to UNDERVOLT the GPU (without touching the clocks) on both core and memory. Assuming that most people would just overclock the GPU in laptops without 0 regard for temperatures or power consumption is misguided at best. Laptop users are far more cautious with such modifications and usually opt for undervolting. Besides, if a GPU is over-stressed because someone ended up overclocking it, other issues would crop up long before hardware failure... too high temperatures which would easily shut down the OS, artifacting, and a myriad of other issues. Besides, this is a desktop grade RX 580 using desktop drivers... not mobile drivers. That is not a desktop graphics chip...it is a cut-down Mobility graphics. There are differences. Laptops are not made to be overclocked. desktop RX 580 with 4GB. RX 580 with 4GB except the clock frequency. people automatically assume overclocking when Wattman is concerned? All I want is UNDERVOLTING enabled on stock clocks. Regardless...no laptop currently offers Wattman. If you want to explain your reasoning..explain it to the OEM. I'm sure they would be happy to explain it to you. AMD recommends using the graphics drivers provided by your notebook's manufacturer as the manufacturer may customize the drivers to support the built-in display and the features and functions specific to the notebook. Customized graphics drivers are available for download from most notebook manufacturer's web site. If the current operating system is not the version originally installed on the notebook it may not meet all requirements and compatible graphics drivers may not be available. Please refer to the notebook manufacturer for supported operating systems and drivers. AMD provides a reference for AMD Mobility Radeon graphics drivers with limited support for notebook specific features and functions. This is not intended to be used as a replacement for the notebook manufacturer's driver. Wouldn't make an ounce of difference even if I tried as OEM's can be rather stubborn like that and they stop releasing new drivers pretty much after the orginal ones were supplied on their website (except potentially the BIOS). Also, using the original drivers as provided by Asus is a waste of time since they also don't have Wattman enabled. Freesync is fully functional with the new drivers if one uses an express install, and I guess I will have to stick with MSI afterburner for the undervolt. I found a work around to make wattman work.. installed current drivers, 18.3.4, radeon overlay and chill work but no wattman. 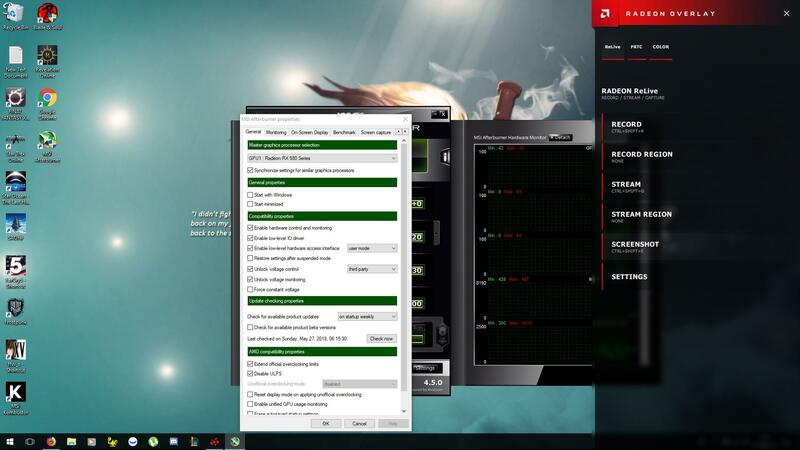 Install msi afterburner and change a few settings, and apply. Now open radeon and wattman should be available. Not all features work, but if you make custom profiles for each game, you are given full clock and voltage control in those menus. I think you can uninstall msi after, but I intend to leave it because you'll likely need it next time you update drivers. Can you tell me how you managed to pull this off? I installed MSI Afterburner (newest), but when I cap the temperature or clock and click apply, it jumps back to stock values immediately. I open Radeon Settings, but there's no WattMan either. Did you have to enable kernel-mode settings in Afterburner to make any significant changes? I really don't want to mess things up, I too am only after downclocking the notebook to make it more silent in late night gaming sessions. I got it: after installing MSI afterburner, and playing with it, it didnt seem to work because everything was enabled and no change to the lack of wattman, but after I fully disabled all options(and I mean, all, one by one) in the afterburner main settings page, then reenabled them as seen in the images(the enabling of the io settings had to happen first followed by afterburner restarting, then after reloading the afterburner disabled the ULPS and rebooted the pc) when it came back up, wattman had reappeared and afterburner is also working without conflict, though I intend to remove afterburner for now as my desired outcome was to have a working wattman again.